Quite the gem awaits you at Pompilios in Newport, Kentucky (a few minutes from Fountain Square). The famous toothpick scene in the movie Rainman, with Dustin Hoffman, was filmed in the bar at Pompilios….and has kept visitors and locals pouring in for years! Pompilios features that bar, Colonel Pomp’s Tavern, at the front, a bocci bar out back (complete with bocci-ball court), and an Italian “red-sauce” restaurant in between. The bar area is the hot spot for satisfying a thirst. You will see one of the best tied-house back bars in the Midwest, built the year FDR entered the Whitehouse—1933, when Pompilios opened for business. Colonel Pomp’s Tavern features period photos of the 1930s, but the bar area itself is that old, and a step back in time. The scene from Rainman was filmed in that very place, for an even richer taste of history. Colonel Pomp’s features a good number of Greater Cincinnati’s very best craft beers on tap, which visitors love to try. The tavern also on Thursday or Friday features live music from an assortment of talents featuring boogie woogie, acoustic Americana rock, jazz, blues and more. We, at Key magazine, suggest you go there and experience Colonel Pomp’s and grab a table and have a meal too, lunch or dinner. We mentioned red sauce because Pompilios features some of the best red-sauce dishes around. 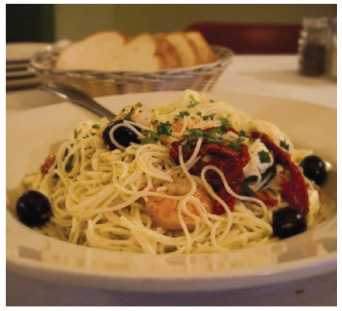 Pompilios has a slew of Taste of Cincinnati winners on their menu, so ask your server about the “Blue Ribbon” dishes. Also, the place has been voted into the Italian Restaurant Hall of Fame. Pompilios makes EVERYTHING from scratch. The ravioli is hand-made, either meat or cheese. There are six sauce choices for ravioli, Bolognese meat sauce, along with marinara, regular meat sauce, meatballs, Alfredo, puttanesca, and you can also add Italian sausage. The Italian sampler, a favorite of the Rainman crew, is a Taste of Italy, with lasagna, meat and cheese ravioli, eggplant parmigiana and Italian sausage and meatball (both made in-house, as well). The sampler runs neck and neck with the meat-sauce lasagna as the best seller on the menu. It’s been a house specialty for decades. Those wanting veal, steak or seafood will find a number of dishes, including veal parmigiana, filet mignon, shrimp scampi, linguini with clams, salmon gorgonzola, and more. One of Key’s favorite dishes is, the brasciuole, tender round steak seasoned with Italian spices, rolled and baked with marinara sauce and served with spaghetti.